Bob always accuses me, not in these words but mostly accurately, of eating and cooking like the English. The words he uses are “bland” and “plain.” English cooking is in my blood. My grandmother on my mother’s side was all English, and though she married my handsome German grandfather (or maybe because German foods aren’t all that exciting either), her fanciest dinner was roast beef and Yorkshire pudding. My mother, of course, inherited her menu patterns. Dinnertime at our house during my childhood began with the words, “who’s peeling the potatoes tonight?” and we ate boiled potatoes nearly every night. That might have had something to do with the fact that potatoes were cheap and there were seven mouths to feed, but let’s get to my point. Ordering something weird was intended as a way to pull myself out of the food rut I might be in. It is easy and comforting to order the same thing every time at your favorite restaurant, but travel is intended to expand your horizons, so I included food exploration as a goal of this trip. In the case of my favorite food, chocolate, this proved impossible. Maybe the good chocolates were too expensive, given the pound-dollar exchange rate, but I ended up eating Cadbury throughout our stay. Oh well. Better luck was found in the breakfast, lunch, and dinner categories. In Scotland, we found the most delicious apple tarts for breakfast, which I have already described (see the essay “Visit Scotland—Done”). We ate a good amount of fish and chips, the best of which (Bob thought) was found at a fast-food type place called Carlos in Alnwick. We ate a few meat pies, a common English fast food that I wanted to try. 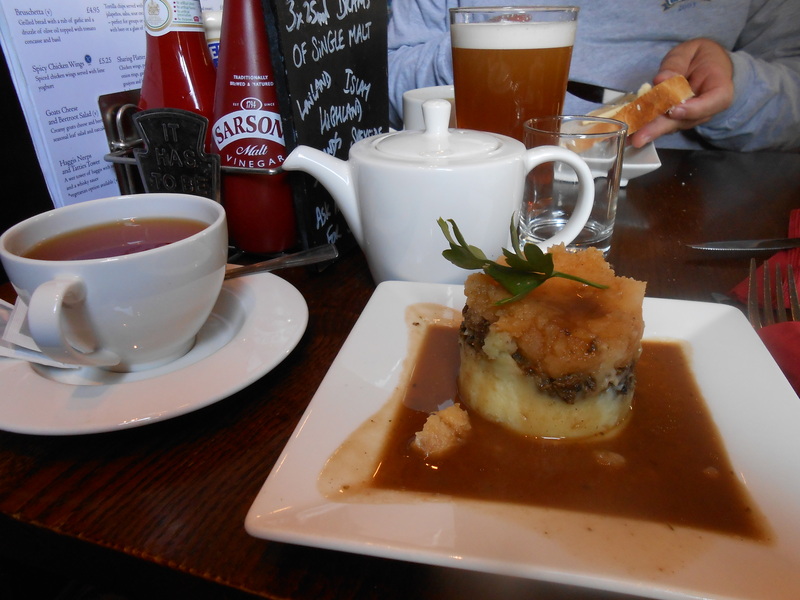 Cold pork pie is not a snack I’ll ever go for again, but the hot lamb pie at the Sampson Inn in Gilsland on the last day of our Hadrian’s Wall hike would have been worth walking any distance for. I tried a couple of dinners with Yorkshire pudding, and neither pudding was as good as my grandmother’s, mother’s, or, with due humility, my own. Bob discovered another kind of pudding that is now his dream dessert—sticky toffee pudding. As time went by in our trip, we ordered smaller and smaller meals. Only a bare few of the things we chose turned out to be less than scrumptious, and eventually we couldn’t stuff any more goodness in our tummies! 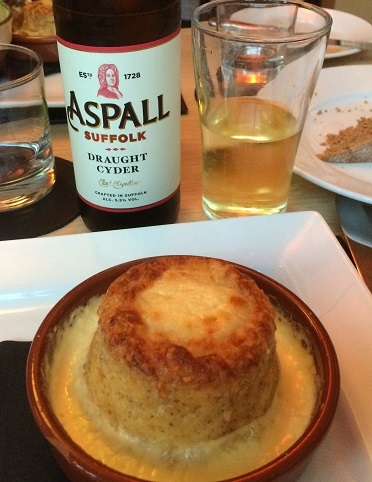 By the time we reached Berwick, a dinner of a simple Northumberland cheese and leek souffle was perfect. Not very weird, but different. 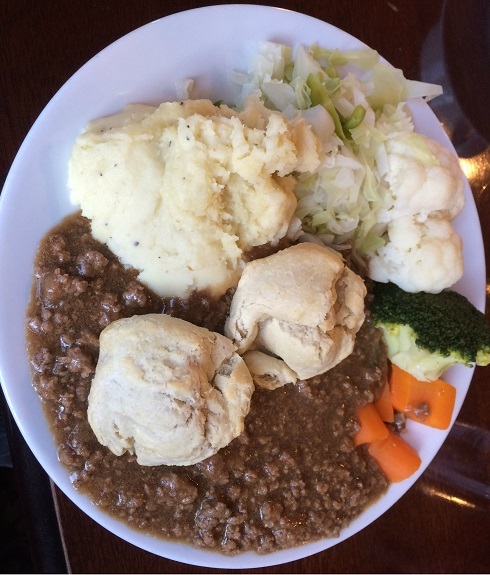 Higher on the weirdness scale was the”mince and dumplings with mash and fresh vegetables” I ordered at the Fleece restaurant in Alnwick. The “mince” turned out to be hamburger cooked in a thick sauce, and “mash,” as we had figured out, is just mashed potatoes. Tasty, and certainly not something you’d find on an American menu. A little weird. 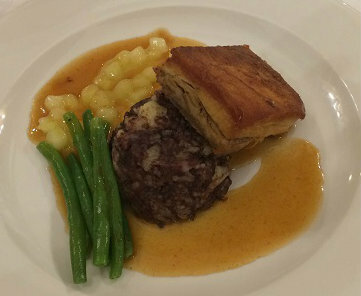 On our last day in Alnwick, at the fancy White Swan, I ordered pork belly with black gravy mash (mashed potatoes with big chunks of black gravy). Black gravy is one step away from being just blood and thus pretty intimidating. It was weirdly good, however, and I bravely ate it all. Finally, at a restaurant in Edinburgh called No. 1 High Street, I found the weirdest menu entry: “Haggis Neeps and Tatties Tower.” No punctuation, and no translation for us foreigners. The “tower” part turned out to be just that—the layers of haggis, neeps, and tatties were formed into a small tower of food. A friend of mine who lived in Scotland made a horrible face when I told him I had eaten haggis. It’s made of sheep’s liver, heart, and lungs. Um, yum? The Scots must like it, because it was on almost every menu. Neeps are some kind of root vegetable, maybe turnips, maybe rutabagas, maybe something called “swedes.” The ones that came on my tower were yellow like rutabagas. Tatties are mashed potatoes. I found this weird dish, with apologies to my English grandmother, delicious. Previous Article Previous Article: Visit Scotland—Done!